In the process of trying to design my Convention swap cards, there were some cards that didn't quite make it. Either I wasn't happy with the way they turned out, or they were too time-consuming to try to mass produce 50 of them. 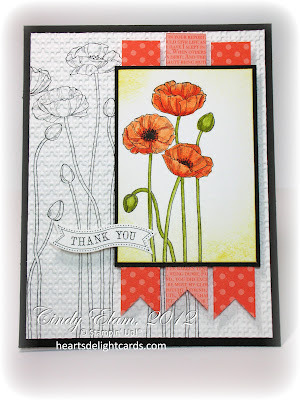 This is one of them.The Pleasant Poppies background stamp is gorgeous, but I couldn't help hearing the Wicked Witch of the West's voice in my head saying, "POPpies. Poppies will put them to sleep." I liked this card, but decided to go in a whole different direction with the swap cards. 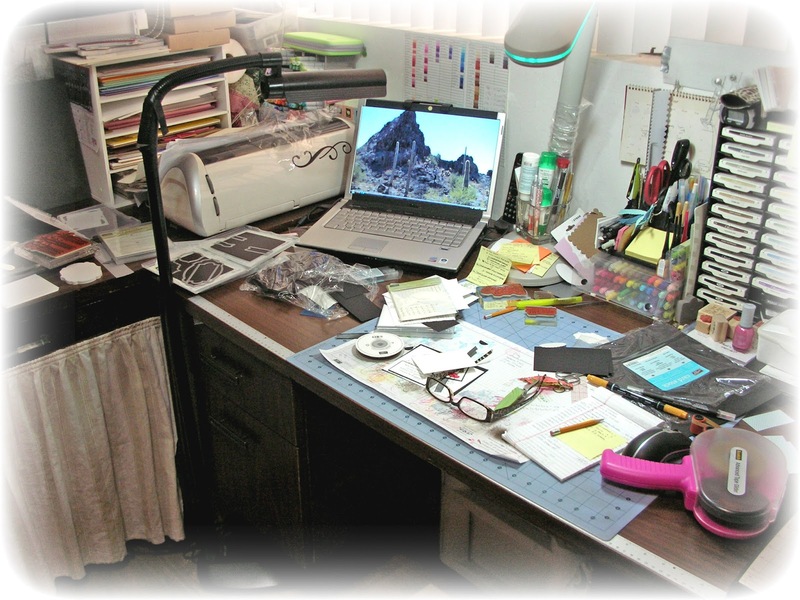 Plus, the thought of coloring 50 images and cutting 150 banners made my eyes cross! So, this will be a good Thank You card for my cousin, with whom I am staying for two nights before heading to Salt Lake City for the BIG SHOW. Great card! I love the colors, but right- 150 banners? Hello! My name is Kelly and I just joined your blog! I love the poppies! I can't wait to use them myself! All of your cards are beautiful! Your desk looks neat compared to mine. LOL. I love the card and enjoy all the amazing creations on your blog. Have fun at convention. I'm missing it this year for the first time. :( Couldn't justify the plane ticket. But I plan to go to leadership for sure. Poppies are a lovely sight.